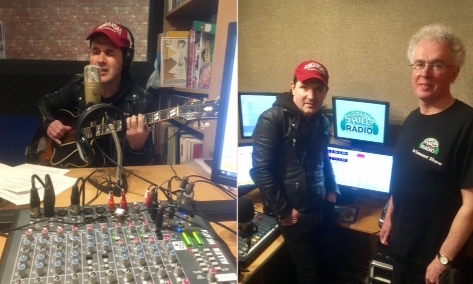 Upon arriving for his interview and live session on 24th February 2017, Belfast-based singer-songwriter Brian Houston was greatly impressed that our Elvis poster in Studio B pictured The King, in his famous ’68 Comeback Special, playing a similar Gibson guitar to his own. Well the DJ certainly did for this session! Presenter Chris Stagg has long been a fan of Brian and regularly features his songs on his monthly ‘In Concert’ show, not least his 4-by-4 Special on New Years Day; Brian being one of the ‘4’ who each had ‘4’ songs featured. Indeed, Chris believes he has just about all his albums, including limited/special releases, since first album ‘Crush’ was released in 1994, through to his 2016 album ‘Songs From My Father’. Performing concerts in Stoke D’Abernon on the 23rd and in Weybridge on 24th was too local and too good an opportunity to miss! Thankfully, Brian had some free time on the 24th to come in and talk about his life in music for the past 20+ years. The catch-up link to the 95min show is attached here and as well as some enlightening conversation includes a mixture of his CD tracks and new songs played ‘live’ in Studio B using the aforementioned Gibson! Fabulous artist. Fabulous guest. See www.brianhouston.com for more. And to sign up for his regular newsletter, that often includes free tracks to enjoy.